Your dogs separation anxiety can cause destruction in your home and make you and your Cocker's lives miserable. Learn what causes separation distress, the symptoms to look for, and what you can do to help your Spaniel manage better when he's left home alone. Before attempting to manage your dogs separation anxiety it's helpful to understand what causes his anxiety and what may trigger it, as well as any symptoms he may be showing. 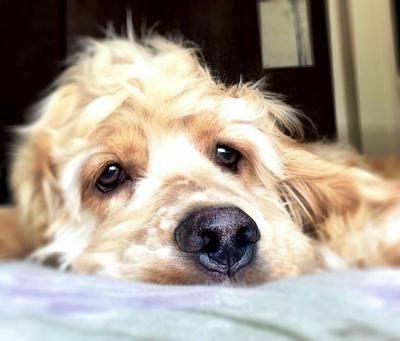 What Can Cause Separation Anxiety In Dogs? Cocker Spaniels are very much family dogs and many don't like being left on their own for very long, if at all. They often fret when they're alone and worry that you're never coming back. They have no sense of time. Even five minutes alone can seem like a lifetime to them! The thought of being alone and you never returning is enough to cause him to become anxious. Anxious dogs often try to 'dig' their way out by scratching at doors or the floor and can become very destructive. What Can Trigger My Dogs Separation Anxiety? Don't be fooled, our Cockers easily pick up on everyday actions and soon learn to recognise our behaviour patterns. They know when we're planning to leave, sometimes even before we do! Understanding what triggers your dogs separation anxiety will help you to avoid them and help to make your pet more tolerant to being left alone. For example, your dogs separation anxiety is likely to be triggered when he sees the signs that you're about to leave (without him!) such as picking your keys up or putting on your coat. If you always do the same things before you go out your dog will begin to get anxious as soon as he sees you doing any one of these things. Your Cocker has no way of knowing when, or even whether or not you'll be back, and this is what 'freaks him out'. Try to vary your behavior slightly each time before you go out. Don't let him see any real pattern which could indicate that you're about to leave the house. For example, if you need to take a coat or a shopping bag with you, perhaps you could place them just outside the door a few minutes before you leave. Obviously, try to do this without your dog seeing you. Don't always leave by the front door. If possible, leave by a back door or an alternate exit whenever you can. 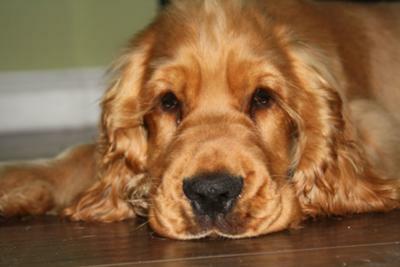 Your Cocker Spaniel may lose his appetite or conversely, eat anything that he can get his paws on. The symptoms of separation anxiety in dogs are often worse during the first hour or so of being left alone. The answer is often to keep him occupied at least during this first hour, so that he's less likely to become bored and will hopefully stay out of mischief. Punishing your dog for his anxious behaviour is not the answer, even if he does become destructive. Your Cocker can't help it; instead, you might like to try some of the remedies suggested below. Plenty Of Exercise To Tire Him Out! If your dog has too much pent up energy, he's more likely to get into mischief if he's left on his own. Lots of physical exercise and mental stimulation can help with your dogs separation anxiety as both will help to tire him out and make him feel less stressed. After a brisk walk or a good burst of exercise, your Cocker will be relaxed and much more likely to sleep if he's left on his own. You might also like to try a few puppy obedience training exercises or some exciting puppy games to give the mental stimulation to help with your dogs separation anxiety. A good selection of interesting toys to play with will help to stop your dog's separation anxiety. Make sure the toys are safe enough for him to play with unsupervised, for example, nylon bones, rope toys, and other safe chew toys. Kongs are a great way of keeping your dog busy, especially if they're stuffed full of treats. Kongs are strong and chew-able, and can be filled with food such as grated cheese or cream cheese, kibble, sausage, hot-dogs, liver, chicken, peanut butter - in fact, anything your dog likes to eat. I bought Max a hollow bone filled with a meaty paste from the local pet shop. Unfortunately, he wasn't too keen on the paste so I dug it out and replaced it with my own filling. I've used a mixture of kibble and meat paste, hot-dog and meat paste, and cream cheese and sausage. He loves them all and it keeps him quiet for a while! They're ideal as the bone may be used over and over again and to make it more interesting (and last longer) you can even freeze them. Great on a really hot day! These hollow bones have certainly helped with my dogs separation anxiety, but if you use them, don't forget to offset any treats you give your dog against his food allowance otherwise you'll end up with a fat Cocker Spaniel! And remember to rotate his toys so that he doesn't get bored with them. If You're Going Out - Don't Fuss. Just Go! When it's time to leave the house, don't make a fuss. Just go, otherwise there's the danger that you make your dog more nervous and anxious about being left on his own. Without making any fuss, leave the house by the front door and close it behind you. Let your Cocker see you leave. Wait for a few moments and then return. The aim is not to allow your Cocker Spaniel time to become upset. Don't make a fuss of him on your return otherwise he may see the attention as confirmation from you that he was right to be anxious. Don't react to him at all. Wait for a few moments, until he's calmed down (if he's hyper) then when he's quiet greet him and stroke him quietly. Repeat this exercise several times a day, whenever you get the chance. As your dogs separation anxiety isn't limited to when you leave the house (it could be triggered when you leave the room), I recommend you also practice this exercise to help get your dog used to you leaving and returning. Walk into another room and close the door behind you. Wait a few seconds and then return. Don't speak to your Spaniel or make eye contact with him. Gradually lengthen the time you stay behind the door and then vary it so that he's never sure how long you're going to be away. Even if you're not planning to go out, I recommend you leave your Cocker alone for an hour or so each day to get him used to being alone. For example, leave the house and then slip back through another door, without your dog seeing or hearing you, leaving you to get on with whatever you need to do! If you're worried, you can still peek in on him to see how he's doing, so long as you're quiet enough! If you think he may hear you, you could always peek through a window to see how he's doing. To help make your dog or puppy feel safe and secure while you're away, you might want to consider leaving him in his crate. You can lock him in or simply leave the door ajar. If you don't lock him in, you might want to confine him to one room. If he's been fed and watered, exercised, is feeling safe and secure, and has a full tummy, he'll probably relax and fall asleep. As well as helping with your dogs separation anxiety, crating your pet will help with many situations. Learn more, including how to crate train your puppy. If you leave a radio switched on to a classical, easy listening, or chat station, it may help your Cocker Spaniel to relax. The sound of voices from a chat show or conversational radio station may make him feel that there's someone in the house with him and may help him to feel more relaxed. Send Your Cocker Spaniel To Boarding School! If your pet is wrecking your home and you're at your wits end, (and if you can afford it) why not consider putting your dog in a local kennel as a day boarder while you're away from home, at least until you've resolved your dogs separation anxiety? Putting your pet into a kennel occasionally can help to socialise him. It can also help to calm and relax him, especially if he's mixing with other calm, relaxed and happy Spaniels! Just like a child at nursery school, your dog will learn from other dogs and will learn that he can be away from you for a while and still have fun and be happy. A cheaper alternative to kennels would be to use a reliable dog sitter or walker for an hour or so each day, or a friend or neighbour. This should help to break up the time your Cocker is alone and the extra walk would help to relax him. Your pet's separation anxiety may not be so straightforward to deal with, especially when it means you have to ignore his behaviour when you return home. You have this cute little Cocker Spaniel, who's so pleased to see you that he's going mad with excitement (after all, he probably thought he was never going to see you again!). It's so difficult to ignore him when all you want to do is give him a cuddle. However, it really is better to leave him until he's settled down before giving him any attention or affection. It won't be long before he learns that he won't get a cuddle until he's calm and quiet. With a little forethought and planning, separation anxiety in dogs can be overcome and when your pet has mastered being comfortable left on his own, he'll greet you calmly each time you return home. Before you leave the house, make sure he's warm, comfortable, fed and watered, and has plenty to occupy him. If you've walked him first and his little tummy is full, he may well fall asleep in his crate. When you come home he may pick up a slipper, a shoe, or one of his favourite toys and bring it to you as a present. This is quite sweet, endearing, behaviour, and if he does this in a calm, relaxed (ish) manner, then it's acceptable. If you can get this far with your Cocker Spaniel, you've cracked your dogs separation anxiety! Puppy Separation Anxiety: Puppies suffer from separation anxiety too! Learn how to raise your puppy so that he's used to (and enjoys) being left on his own from time to time.